Along with demolition services Deconstruction Pro. also offers hauling services to its customer. Deconstruction provides a safe and easy way to haul away construction debris and junk. Hauling services take the work out of junk removal. 1. How Do Hauling Services Work? Hauling services are one of the simple things in life. A hauling service does exactly what its name implies: haul away junk, debris, and trash. Deconstruction’s hauling services specialize in construction debris hauling, junk removal, and trash removal. We also offer bulky item removals for hard to remove items like appliances and mattresses. 2. Do You Haul Construction Debris? Yes. We specialize in hauling construction debris. We can remove just about any type of construction debris from a site, including concrete and asphalt. We also haul wood, tile, and most other types of construction debris. We also provide construction debris hauling as part of our demolition services. 3. Do You Offer Construction Debris Hauling as Part of Your Demolition Services? Yes. We do many types of demolition — kitchen demolition, bathroom demolition, and concrete demolition being some of many. 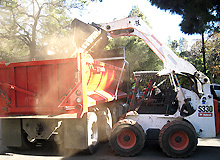 As part of these demolition services we also construction debris hauling services. 4. Does Your Hauling Service Offer Junk Removal? Yes. Deconstruction Pro. offers a junk removal service as well. As part of our hauling services we can clean out most types of junk and remove it permanently. We also specialize in backyard clean up and garage clean out. 5. How Much Does Your Hauling Service Cost? Our hauling services vary in cost depending on what exactly you need. Deconstruction Pro has a hauling or junk removal service to fit your needs and your price. We provide Quality Demolition Work. We’re always on the look out for new projects.